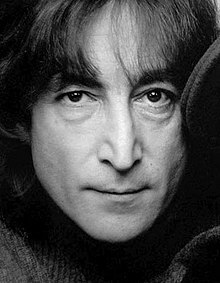 Va John Winston Ono Lennon (ruggit 9 Jerrey Fouyir 1940) ny chiaulleyder, ny arraneyder, ny vard arrane, as ny yl-chloieder greienyn Sostynagh. Marish Paul McCartney, George Harrison, as Ringo Starr, hooar eh ard-ghoo myr oltey jeh ny Beatles, as ta'n co-obbraghey marish McCartney echey nane jeh ny boodeeyssyn smoo ennymoil jeh'n 20oo cheead. Lurg ren y phossan brishey seose, ren eh lorgey coorse lomarcan, as ren eh croo yn possan Plastic Ono Band marish e nah ven, Yoko. Hie yn duillag shoh er ny reaghey er 13 Jerrey Fouyir 2013, ec 16:04.